Dr. Kimberly Nolan García, my friend and colleague from the International Studies Division at CIDE (in the Santa Fé campus) came to CIDE Región Centro to visit, promote the undergraduate degree at CIDE Santa Fé here in Aguascalientes (we have a dual degree in Political Science and International Relations at CIDE Santa Fé, whereas our undergraduate degree here is on Government and Public Finance). Kim also gave a couple of talks. I fully recognize how hard it is to do a talk for undergraduate levels, so kudos to her for making something that is somewhat foreign (labour rights in the context of North American politics) to students so easy to digest. I found Kim’s talk really interesting because we do study similar stuff. I have looked at how environmental non-governmental organizations use the Citizen Submission on Enforcement Matters mechanism of the North American Agreement on Environmental Cooperation (NAAEC), whereas Kim has looked at the transnational dimensions of labour rights organizations and the use of a similar mechanism within the North American Agreement on Labour Cooperation (NAALC). An interesting paper that you may find useful from Kim is linked here. In a similar fashion to what I and my coauthors found in Pacheco-Vega, Fox and Weibust (2010), Kim also finds that there is at least one country where the mechanism is not being used to a larger extent. In labour, as Nolan García demonstrates, it is Canada, whereas in environment, it is in the United States of America. 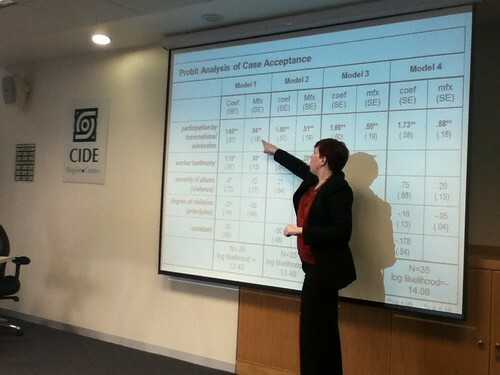 Another interesting discussion worth having is the fact that in environment, CSEM is used to denounce countries’ national environmental law violations, whereas in the labour agreement, the mechanism is used to denounce violations against individuals’ rights (which, as can be seen, generates a much larger dataset than in the case of CSEM). Overall, a very interesting talk worth discussing further. Tagged with Kimberly Nolan Garcia, research, transnational advocacy networks.